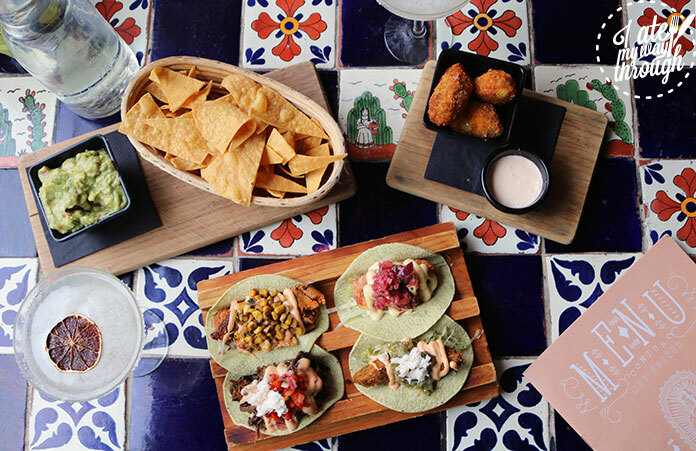 At the very top of the Eastern Hotel, located in Westfield Bondi, you’ll find the vibrant El Topo Mexican. 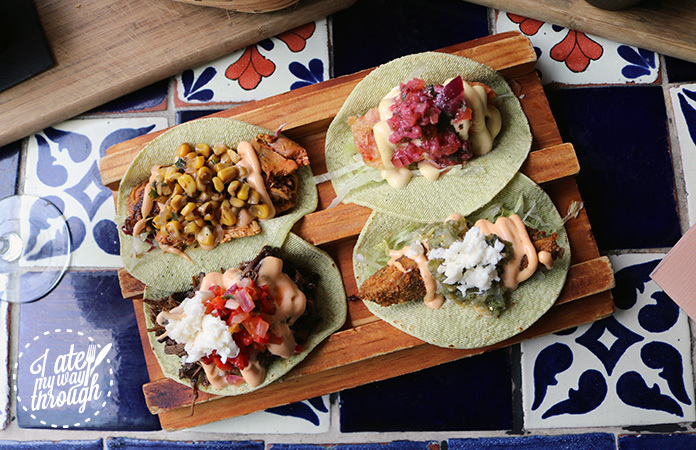 The crowning jewel in the Eastern’s crown, El Topo is a rooftop bar and restaurant serving up some classic Mexican dishes, and some with a bit of a twist. Settle in to one of their decorated booths, portraying some essential Central American imagery and playing some tunes that will mentally whisk you away to some beachside Mexican cantina. It’s the perfect place to relax away from the busy streets below. 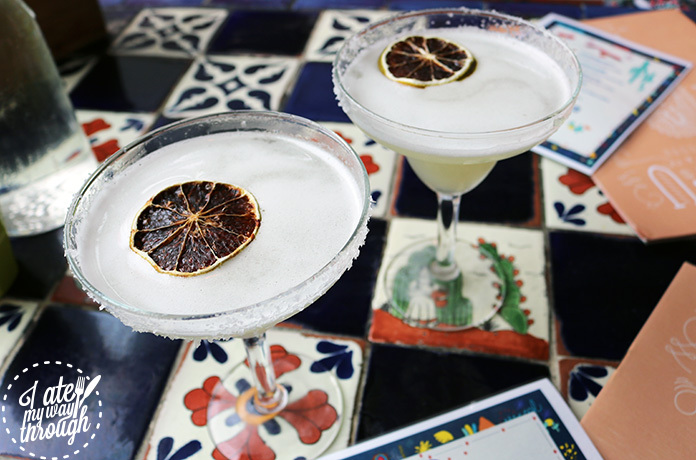 To whet our appetites and kick off the weekend vibes early we partook in two Classic Margaritas ($17ea). Using Don Julio Resposado tequila, Cointreau and citrus then garnished with a slice of dehydrated lemon, it was a great way to relax yourself into an enjoyable meal. They go down a treat, and it would have been way too easy to try out the rest of the margarita menu while there. 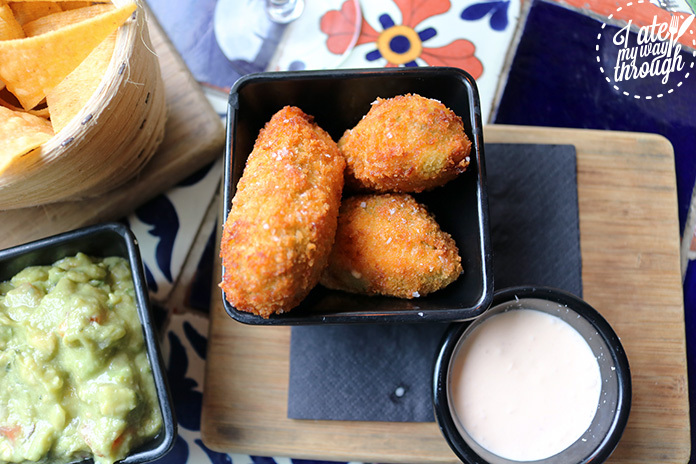 For entree the Jalapeno poppers ($9) are a great way to dive straight into your Mexican feast. Stuffed with goats cheese and smoked paprika with creme agria (Mexican style sour cream), they still had some heat to them but this heat was well balanced by the generous, mouth saving amounts of cheese within. I really liked them, and thought that the flavours were good and that the cheese and crema agria were quite refreshing after the spice. Having previously been a vegetarian for several years, I’ve eaten a lot of boring tacos of just beans and salsa but the Coconut Crusted Avocado taco ($6) at El Topo was something really different. With tomatillo salsa verde and queso, I’d never before eaten a veggie taco like this, and being in love with anything coconut this was right up my alley. It was a really pleasant taco, with mild flavours, so for the chilli-phobes out there give this a try. 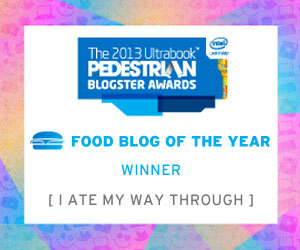 My dining companion had the Achiote Chicken taco ($6), which I stole a bite of. A lashing of chipotle mayo, charred corn, lettuce and raddichio accompany the succulent chicken. The chipotle mayo gave the dish an delectable buttery oiliness which only added to the flavour profile of the dish. The charred corn was a good way to add some contrasting crunch to the overall texture. Our waitress told us that the Baja Fish taco ($6) had people coming from all around because it is one of the best that they have had. After trying it, I’d believe her. The fish itself was nice, but for me it was the mix of spicy and sweet from the Habanero mayo and strawberry tomatillo salsa that really set it apart from other tacos I’ve had. The strawberry tomatillo salsa was my favourite part just for it’s unique taste and texture, it was fabulous. 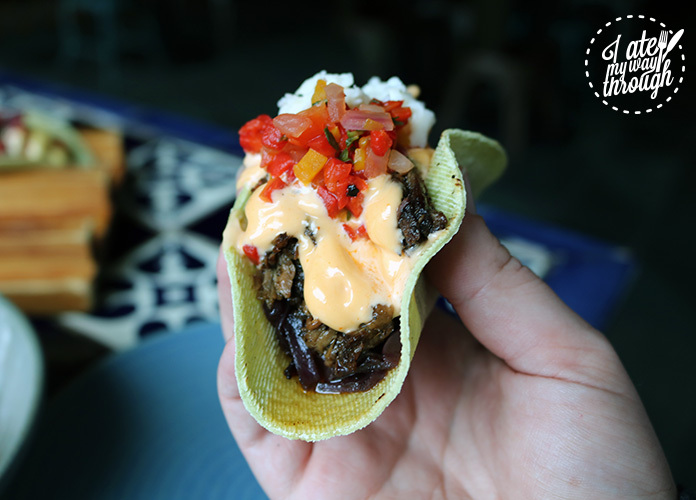 However, my favourite taco of the day would have to be the Coffee Braised Beef taco ($6) with braised cabbage, sriracha, red pepper and queso. Being a coffee lover (read: addict), I often find things that proclaim to be coffee flavoured lacking, it was different at El Topo. In this taco the coffee braise really comes through which is great considering the thickness of the sliced beef. The toppings were a nice addition, but for me the coffee braised beef was the star. The Chipotle charred Corn ($5) is a great dish or snack if you just wanted a little something something on the side. 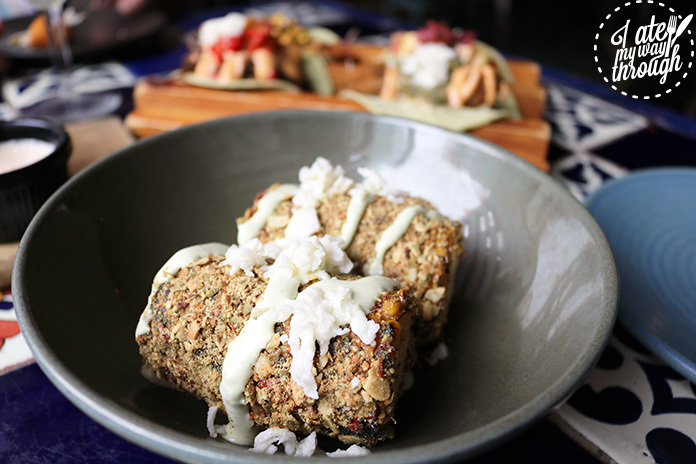 With pumpkin seeds, chipotle sauce, chilli flakes and queso fresco it’s a crunchy calamity of chilli flavours that is sure to set your mouth alight in a flavour explosion. My partner had to struggle through some chilli tears, but we both agreed that it was just too good not to finish it. 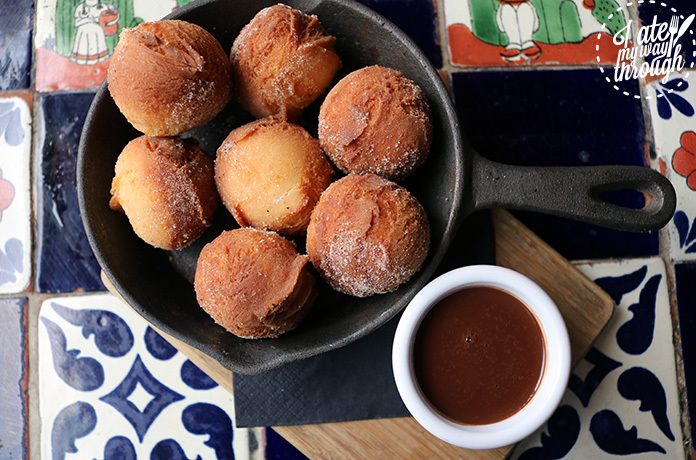 Rounding out the lunch with a Bunuelos con Chocolate ($12) to share was probably one of my better ideas that day. The Mexican donuts are less sweet than your usual cinnamon sugar sort, as was the chocolate sauce. Meaning that adding a dessert into the mix wasn’t too sickly after all the spice of the previous dishes. Definitely get your friends together, grab some margaritas and see which one of your can eat your way into a food siesta the quickest. Arriba!